The purpose of this book is to inform you about posturality, a crucial aspect of individual and collective human being. Having worked professionally as a teacher in this area for almost 35 years, I am all too aware of the dearth of knowledge, both practical and theoretical, among lay people and professionals, about posturality. 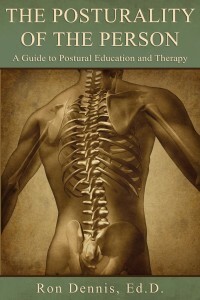 My students, most of whom come to me because they are in pain, tell me that they suspect that their posture is somehow connected with their problem, but that they don’t know what to do about it. … As to the unfamiliar term “posturality,” Webster’s New International Dictionary says that the suffix “-ity” indicates the state or quality of something—mentality, physicality, personality—thus posturality, the state or quality of one’s posture. Alexander Revisited collects Ron Dennis’s Alexandrian writings over 35 years, most of which were first published as articles in NASTAT/AmSAT News, along with several from a newsletter he produced on coming to Atlanta in 1990, and others that came along from academic and other Alexander literature. This collection of Ron Dennis’ writings is, to my mind, the great reward and gift to us all for his long-term and relentless commitment to clarity of thought in the Alexander Technique. Although the articles herein have been published separately, their appearance here where they can be read together and repeatedly—I suggest at least 2 or 3 times—does an inestimable service to the community of AT teachers. These little pieces intended for the Alexander novice have lasting value, not only as precursors to his better known writing, but especially for the polished miniatures they are in themselves. All in all, this little book (which is deceptively thin) (and delightfully readable) is a very rich and helpful collection of articles to help illuminate and question our understandings of what is happening when we are engaged in life. The collection and organization of these pieces into a book not only makes them accessible to new readers, but brings to readers both new and old a special value that is decisively greater than the sum of its parts. 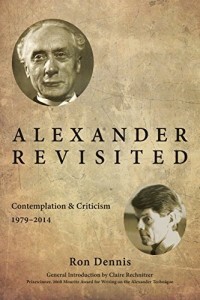 Alexander Revisited is available at Amazon.com.